CHICAGO - Lithuanian Documentary Film Festival in cooperation with Lithuanian Consulate General in Chicago and the Lithuanian Foundation, are pleased to present its first edition with a retrospective of eight documentary films. "Examining the World's Global issues through a Lithuanian lens". 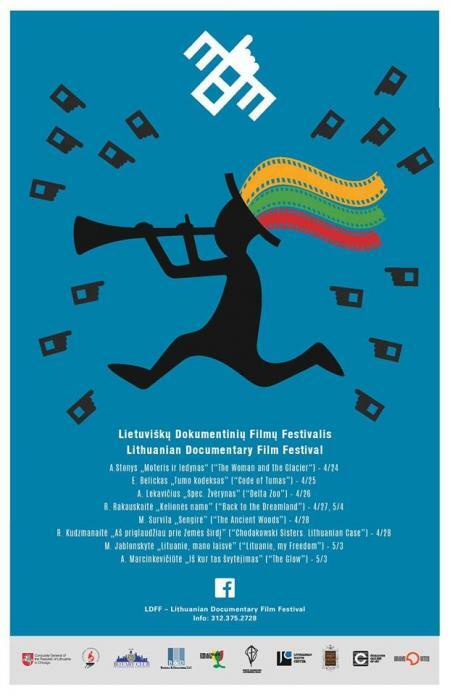 The Lithuanian Documentary Film Festival opens Wednesday, April 24th at 7pm at Chopin Theatre with The Woman and the Glacier. The Woman and the Glacier (56 mins) analyzes the daily life of a woman in the frigid glacier of staggering beauty. Kazakhstan. Tian Shan mountains. Tuiuksu glacier. Glaciological station in the height of 3500 m. Here, for thirty years lives a woman totally alone and without any connection with the civilized world. She devoted all of her life to science to keep her finger on the pulse of the planet. Director Audrius Stonys will be joined on Opening Night by directors from the other films of the festival Eimantas Belickas (Code of Tumas), Mindaugas Survila (The Ancient Woods), Andrius Lekavicius (Delta Zoo), Agne Marcinkeviciute (The Glow) and Ramune Rakauskaite (Back to the Dreamland). A reception follows the screening. Complimentary parking available at Holy Trinity Church on Division St., one block east of Chopin Theatre. Media passes, photographs, videos, interviews and additional materials are available upon request. Audrius Stonys is a Lithuanian documentary film maker, producer and a member of the European Documentary Network as well as European Film Academy. He began his creative activities in the last years of the Soviet Empire and since that time he has made 20 films. His many international film awards include Audience Award in Nyon; Grand Prix in Split; and prizes at Bornholm, Gyor, Neu Brandenburg, Barcelona, Florence, Krakow Oberhausen and San Francisco. He is also the recipient of Lithuanian National Prize. His 1992 film Earth of the Blind" received Best European Documentary of the Year by European Film Academy. While his 2011 film Ramin was selected as the Lithuanian entry for Best Foreign Language film for the 85th annual Academy Awards. Audrius sees the issue of freedom in film to be central, more important than any aesthetic issue. Especially as attempts to limit this freedom have not ceased but have only changed their outer shell. This trend seems to be particularly acute in Documentary film which is attempted to be squeezed into certain standard frame of some sort of information provider, entertainer, emotion-stirrer and educator. He believes Documentary film is not born out of a desire to inform but out of wonder with the discovery of the possibility to stop the time and contemplate the world‘s miracle.